Style is compatible with iPhone. When scrolling up/down, top navigation is always visible and it stays on top of screen. When you are registered and are viewing topic, it also shows extra links for bookmarking and subscribing to topic. This function is not available to IE6 users. You can mark any forum as read from forum index. All you have to do is double click it. New way of a new private message notification that user can't miss, which doesn't use popups. 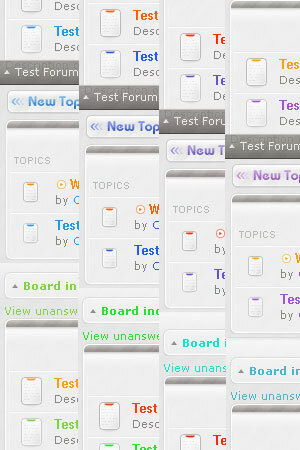 In viewforum you can now sort topics by clicking on column headers ("replies", "views", "last post"). In posts when post subject is ("Re: " + topic title), its no longer being shown. You can show/hide categories on forum index, your selection is remembered in cookies. You can show/hide user's profiles when viewing topic. Instead of showing many buttons in topic view such as "www", "pm", "jabber", etc.. all extra buttons are shown as popup when you move mouse over poster's name. You can copy code to clipboard by clicking "copy" link in code's header.